Henry has been working really hard to improve at kung fu. He attends about 6 hours a week of classes — group, sparring, grappling, weapons, and a private lesson. For the past couple of months he’s been preparing for his green sash test, and Thursday was the big day! Dan, Chloe, Sally, Bob, and I were all there to watch him. Henry demonstrated his mastery of the appropriate techniques and even did some sparring with another student. His teacher, Miss Edwards, led him through the test and Sifu Stanley watched to evaluate his skill. It was extremely intense, and we could see how very hard he was trying and how tiring it was. He “strove with great effort”, as he says, and passed his test! Congratulations, Henry! You’re amazing and we’re all so proud of you! Also, Henry asked me to shave off all his hair so he’d be more streamlined at Kung Fu. No more hair flopping in his eyes, and he doesn’t get quite so hot when he’s in his sparring helmet. He looks a lot different, but still as handsome as ever. Lordy, they were good, and gone by Saturday afternoon. (Twelve rolls is only 4 apiece!) Here’s the recipe: Ninety-Minute Cinnamon Rolls. I always use butter instead of margarine. They’re made of Briggs and Little’s “Tuffy”, an aran-weight 80% wool/20% nylon blend. I love this yarn. It’s a bit rough, still has lanolin and bits of hay in it, and smells of sheep. It seems like it will wear very well. Sunday night, Bob and Chloe came over and we talked and knitted and watched TV and had a wonderful time. You should see Chloe’s socks — I think they’re even prettier than mine: http://www.ravelry.com/projects/xsolv/warm-winter-socks. Same yarn, different colors. This eyelet pattern reminds me of the Sweet Alyssum flowers that grew in our yarn when I was a kid. If I remember correctly, there were white ones and purpleish ones, so if I make these socks again I’ll choose purple instead of orange. This sock fits my skinny size 7.5 foot with room to spare. The eyelet pattern and the Risata are both nice and stretchy. Cast on 48 stitches. I used both colors and this lovely, two-needle, stretchy cast on: http://www.youtube.com/watch?v=xXDMsy949yw. That’s my favorite cast-on for cuff-down socks and mitten cuffs. Work 11 rounds k2 p1 ribbing in Buttermilk. Switch to Clementine, and begin eyelet chart. After 8 rounds of Clementine, switch back to Buttermilk and work next section of eyelet chart. Move round marker forward one stitch so that the eyelet pattern fits within the round. As you knit around, you may need to shift stitches from one needle to another to avoid having to work eyelet motifs between needles. Do whatever makes it easy. Buttermilk eyelet motifs will be centered between the Clementine ones. I carried the yarn loosely up the back of the sock between color rounds so I didn’t have a million ends to weave in. Continue switching colors every 8 rounds and shifting round marker one stitch forward or back until you have four Clementine stripes. Work heel flap in Clementine on 25 stitches. Be sure that your heel flap is centered relative to the lace pattern! I like a long heel flap so I worked 30 rows, I think. I used the basic Heel Stitch. Turn the heel according to your favorite method. I prefer a German heel. Switch to Buttermilk and pick up gusset stitches. Here’s a good way to avoid holes at the corners of your gusset: http://www.youtube.com/watch?v=EOI_oXPm1iA. Arrange stitches so you have your 24 instep stitches on one needle, and continue eyelet pattern across that needle as established. Keep the sole of the foot and gussets in stockinette and decrease away your gusset stitches every other round, with k2tog just before you knit the instep stitches and ssk right after, until you are back at 48 stitches. Arrange stitches on two needles so you have 9 instep stitches on top needle and 9 sole stitches on bottom needle. KNit a few stitches as necessary to get yarn to side of toe. Graft stitches together (tutorial here). Block to open up eyelets, and wear! 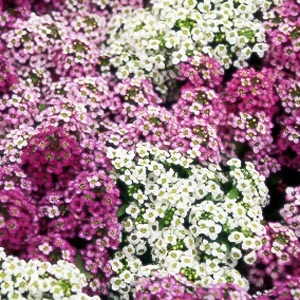 Genuine Sweet Alyssum flowers. Look, each tiny flower really does have four petals! This is not actually a children’s book, but it won’t do the little ones any harm and I think the tweens and teens will like it! This romantic comedy stars a young American girl named Sally, who inherits a considerable fortune and finds her life turned upside down. 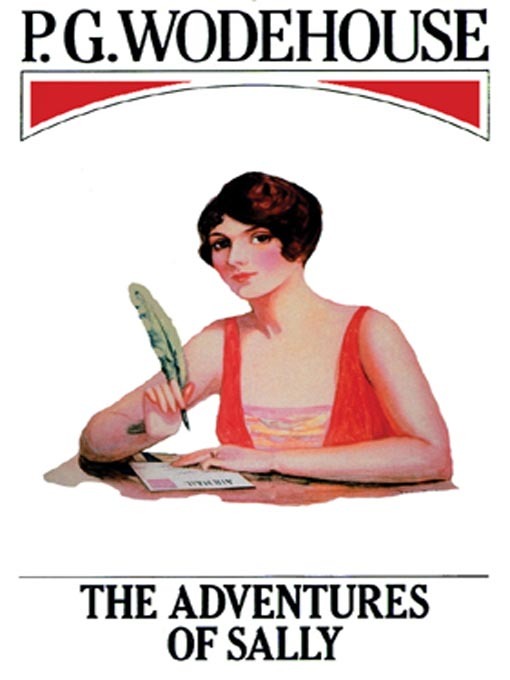 The typically Wodehouseian cast includes Sally’s ambitious brother, an assortment of theater people, a pair of English cousins, and, of course, an Uncle. I’m going to add it to my podcast feed. It’s not strictly a children’s book, but it won’t do the kids any harm and I think the tweens and teenagers will like it! Dan’s hands get cold while he’s computing, and, though my usual “gamer gloves” are like chopped-off mittens, he wanted his fingers to be almost completely covered, so I knit him some fingertip-less gloves based on the Annemor #10 pattern from Selbuvotter: Biography of a Knitting Tradition. Marvelous book, by the way. Yarn: Knitpicks’ Palette, black and gray, exactly 50 grams total for the pair. Needles: Size 00 for the wrist ribbing (I worked 5 or 6 rounds), size 0 for the wrist, size 1 for the hand and fingers, size 0 for the finger ribbing. It took me a while to get the first glove done because I had some gauge issues and had to rip back several times. 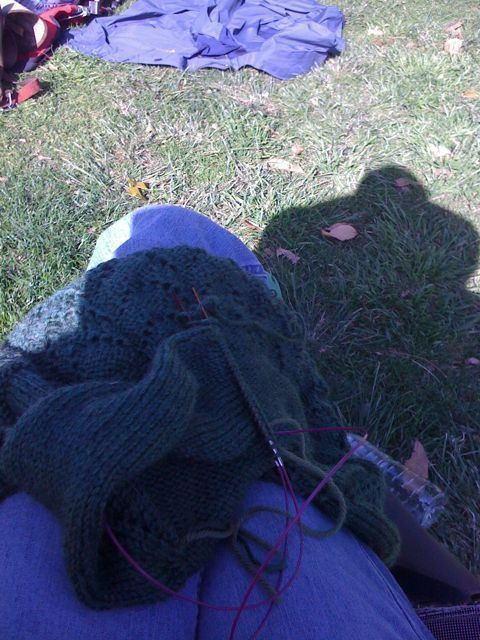 I started out knitting at my usual loose tension on size 0 needles, but the wrist was way too baggy. Then I started over knitting tightly on the 0s, got up to the finger divisions, and the hand was too tight. Ripped back again to the end of the wrist and switched to size 1 needles and a sort of medium tension and it worked out fine. There are not enough stitches charted for the 13-stitch finger pattern to work out, so I had to get creative and redistribute things differently and do a couple of m1s here and there, but it all worked out ok. The second glove worked up really fast! Dan loves them and they keep his hands nice and warm while he’s running around Azeroth. By popular demand, here’s a chart for the edging I used on Kathy’s Stole. It’s a heavily modified version of an antique edging I found online somewhere. The original was twice as wide and didn’t use nicely balanced decreases. Enjoy!